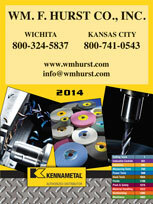 If having high-performance metalworking fluids is important for your business in Kansas City, Wichita, Dallas, Fort Worth, or any surrounding city in the Midwest, then turn to the industrial supply experts at Wm. F. Hurst Co., LLC. We offer cutting and grinding fluids from industry leader Master Chemical, which has designed coolants that help maximize productivity and minimize waste and meet the demands of many specialized industries, including aerospace and automotive. Using Master Chemical metalworking fluids can help reduce your fluid purchases, lower disposal costs, and help lower machine tool costs, providing you immediate savings to your bottom line. In addition to metalworking fluids, we offer a wide range of industrial tools from top-rated manufacturers, such as Kennametal cutting tools, Bosch Rexroth pneumatic tools, and Cleco pneumatic assembly tools. We also offer coated, bonded, and non-woven abrasives, safety equipment, and other industrial supplies. To learn more about our selection of Master Chemical metalworking fluids or any of the other industrial tools and supplies in our inventory, contact us today. Wm. F. Hurst Co. proudly serves businesses in Kansas City, Wichita, Dallas, Fort Worth, Columbia, Joplin, Sedalia, and other cities in the Midwest.